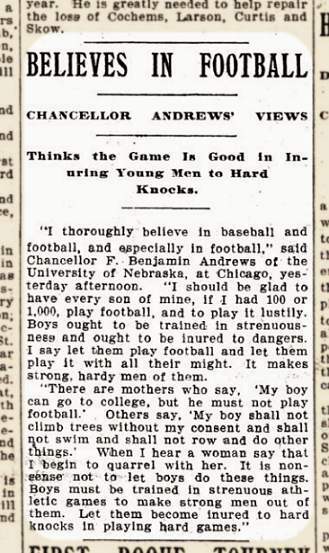 1917: Coach Doc Stewart travels to Beatrice to mend fences with boosters there. 1927: Guy Chamberlin moves from the Philadelphia Yellow Jackets to the Chicago Cardinals in what would be his final year as a player-coach. 1937: Line coach and cattleman Link Lyman likes the returning talent under his tutelage. 1962: The Huskers get set for fall camp with just three quarterbacks on the varsity roster. 1972: Bob Devaney warns fellow conference schools to guard against rules that would degrade the quality of Big Eight football. 1987: Hal Kuck, recently hired as a graduate assistant, commits suicide at age 48. 1992: In a preseason media survey, Colorado is selected by a slim margin over Nebraska as the favorite to win the Big Eight. 2002: The defense dominates in the first scrimmage of fall camp. 2007: Mike Minter decides to retire after 10 seasons in the NFL. 2012: Sophomore offensive lineman Tyler Moore, a part-time starter in 2011, leaves the team.